The Adidas Mad Handle fits like a glove according to numerous owners. This type of lockdown reminds users of the Kevin Durant eleventh Nike signature sneaker. A lot of users leave comments that the shoe has a good grip on the floor because of the multiple grooves in the rubber outsole. Several wearers mention that the padded collar gives a good wrap on the ankles as a support. Many purchasers enjoy the different colorways of the shoe model. Some buyers praise the comfort of the shoe for a reasonable price. Most users compliment that the shoe is true to size. A number of buyers say the shoe is for the narrow footed. A few shoe owners mention that the shoe does not have a good grip around the heel counter. Even if it’s a low-priced hoop shoe, the Adidas Mad Handle has EVA cushioning and padded collar that make it stable and pleasant to use. Still, performance-wise, the Mad Handle is better for light playing. For beastly executions, new buyers are advised to go for quality basketball shoes with impressive feedback from testers. Good examples are Dame Lillard’s fifth signature shoe with Adidas, Paul George’s 3rd Nike sneaker, and Chris Paul’s eleventh Jordan hoop shoe. In my opinion, this is the best Adidas shoe out there right now. Even better than the CrazyLights. The Adidas Mad Handle was released in 2013. It is a classic casual and athletic basketball sneaker. Its flexibility comes from the foam in the midsole. The outsole performs well for both indoor and outdoor courts. Cushion. The awesome performance of the Adidas Mad Handle comes from the EVA cushioning and torsion system in the midsole. The EVA foam absorbs shock and impact greatly. The torsion system allows a more natural movement for the feet. Traction. The court grip of the Adidas Mad Handle comes from the fingerprint pattern on the outsole. The thick rubber outsole also prevents the wearer from slipping. Length and Width. The Adidas Mad Handle comes in the standard width. Though there are some who mentioned it is a little narrow, most owners claim it is true to size and fits them well. Lockdown. The Adidas Mad Handle has a traditional lacing system using oval laces. The thick padding in the tongue and inner of the shoe provides sufficient lockdown. The upper of the Adidas Mad Handle is a combination of patent and synthetic leather. The perforated leather helps wick away moisture. The synthetic leather delivers durability. The patent leather on the heel counter promises a lot of stability. The mesh tongue provides ventilation to the feet. The thick padding on the collar of the shoe give a good amount of support. 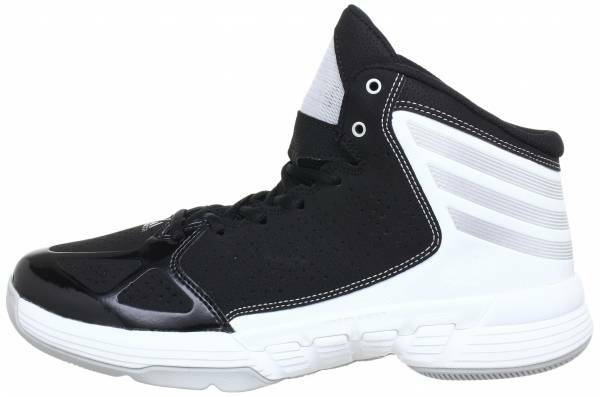 The mid-top design of Adidas Mad Handle provides decent amount of ankle support. There are leather overlays on the forefoot. The company logo and adidas callout are located on the toe box and tongue of the shoe. The heel counter has the signature stripes. The heel counter also has a nice shiny finish. Embossed on the lateral side is the TORSION SYSTEM callout.